Ledrian Saisima shattered the idyllic scene by dropping a bombshell. He revealed himself to be a master spy, and promptly exited the channel. "Who is Ledrian Saisima?" That was the question on everyone's mind. We scrambled to find out as much about him as we could. 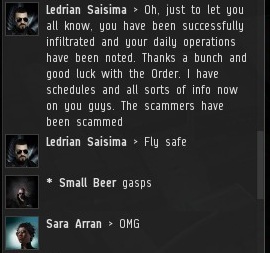 We quickly realized that Ledrian had sent me 220 million isk to buy stock in the New Order. Indeed, he was pictured on the MinerBumping panel listing "This Month's Top Supporters". Agent Zed Freelance Zooloo questioned whether ownership of his shares ought to be revoked, given his status as a spy. But the law of the New Order doesn't work that way. Whatever else he is, the man's still a shareholder. 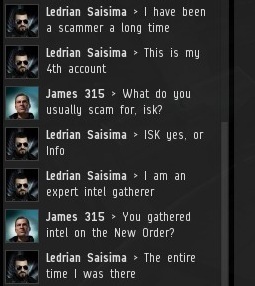 As the New Order's Agents went to work figuring out what had happened, I opened up a private convo with Ledrian. I wanted to hear how he justified himself. Ledrian wasn't surprised by my questions. He seemed perfectly at ease--as though he had been expecting them. Meanwhile, our Agents pored over the available intel. Ledrian had claimed to have acquired "schedules and all sorts of info" on the New Order. Our Agents were eager to get copies of their schedules, so as to better plan their lives. Ledrian knew that by confessing in front of everyone that he was a spy, he was as good as burned. But he asked that the New Order take mercy on Northwest Industries International corp.
Ledrian took full responsibility for his acts of espionage, and asked that revenge not fall upon his contacts and previous employers. The fallout continued. With its trust having been so betrayed, would the New Order ever feel safe again? Unprompted, Ledrian began to reveal his backstory. This wasn't the first time he had breached an organization's security. He was an expert. It was then that I remembered seeing Ledrian's name from somewhere else. 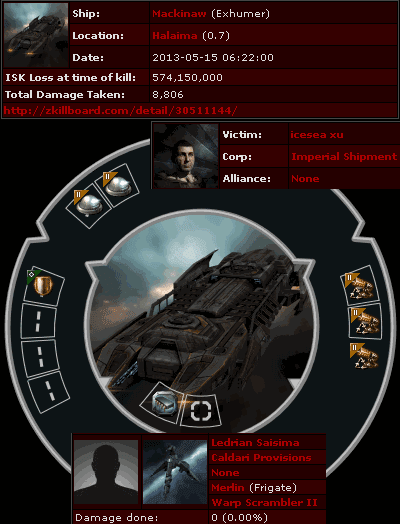 He had been on a Mackinaw killmail which had been featured on a previous Kills of the Week entry. In that entry, I had remarked upon how strange it was that Ledrian was using a Merlin during the gank, while everyone else was using gank Catalysts. Ledrian had used the Merlin to help tackle the Mackinaw. It was all part of his plan to gain the trust of the New Order. Quietly, he spent even more money to make up for it. Back at HQ, our Agents were still puzzling over Ledrian's spycraft. What was the point? What had he done? And why was he willing to spend so much isk to do it? I asked the man himself. 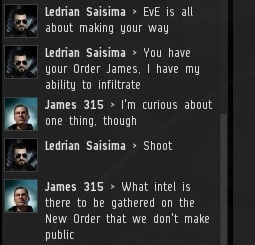 The New Order is the most transparent organization in EVE. Our activities are well known throughout the galaxy, and are often featured on blogs, such as MinerBumping. What exactly had Ledrian gained by spying on us? 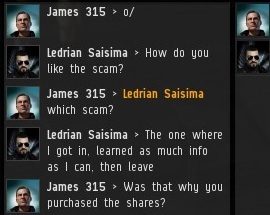 In looking at Ledrian's profile, stock purchases, and Merlin gank ship, I had only scratched the surface. As Ledrian unveiled his master plan, I was about to find out how deep the rabbit hole went. 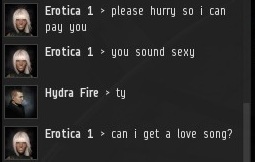 Previously, on MinerBumping... Celebrated isk doubler Erotica 1 invited me to act as an escrow agent to help her 100th client win big in a special Bonus game. 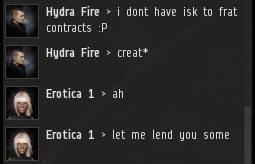 The client, Hydra Fire, was told to systematically contract me all of his assets, which he did. 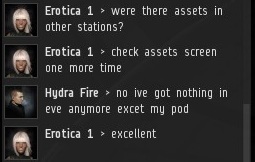 Erotica was well-versed with every possible way in which an EVE player could have assets stored up. 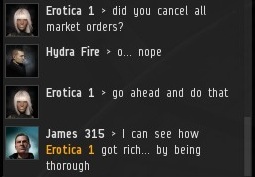 After Hydra took down his market orders, he had a few more assets to transfer to me. But since he had already given away all of his liquid isk, he couldn't pay the contract creation fee. Erotica stepped in and gave him some money to cover it. Everything was going extremely well for everyone involved. Both Erotica and Hydra were acting with the utmost decorum, proving the cynics wrong about EVE. 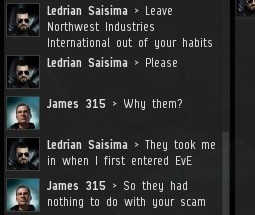 Maybe all of those stories I had heard about slick con artists in Jita were a bunch of hooey. Hydra's task, to put total faith in Erotica and relinquish all in-game assets, was reaching its conclusion. 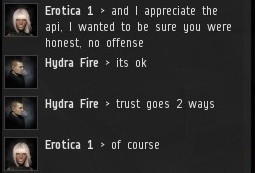 To confirm that Hydra was not attempting to scam Erotica, he had previously supplied a full API for his character. I cross-referenced the contracts he had assigned to me with the API-supplied asset list. The tension was building in the Bonus Room; everyone held their breath as I prepared to make my recommendation as to whether the jackpot should be paid out. Everything was accounted for. Satisfied that everything was in order, I gave Erotica the green light. The big payday was imminent. 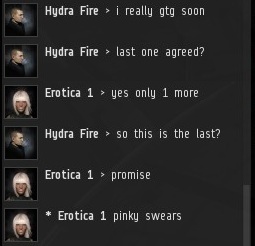 From the beginning, Erotica had Hydra in a TeamSpeak channel. Though Erotica was not able to speak, she could listen. Hydra had done some of his communication regarding the contract transfers via TeamSpeak. Once he started assigning the contracts to me, he relied more on the in-game chat, and was silent in TeamSpeak. 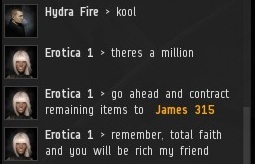 As Erotica prepared to pay Hydra the jackpot, she asked him to speak. This is her custom; she loves getting the live reaction of the big winners when the jackpot is paid out. 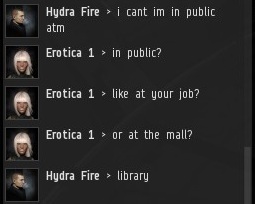 Unfortunately, Hydra didn't feel comfortable speaking aloud, since he was in a public library. Erotica urged him to at least quietly whisper a song to her. Hydra was reluctant. Erotica recommended the song "I'm A Little Teapot". I didn't see any harm in someone whispering a song in a library, especially under these circumstances. As this was going on, Erotica was prepping the big jackpot payout. 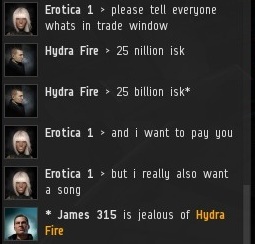 True to her word, she opened up a trade window with Hydra and put the grand prize of 25 billion isk into it. All she had to do was press the "accept" button. The payday was now just a click away. 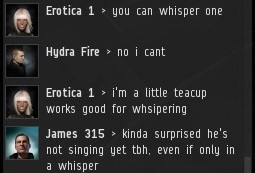 Inspired, Hydra agreed to whisper a song. Hydra ran through "I'm A Little Teapot" in hushed tones. Erotica requested an encore, and asked the participants in the Bonus Room to suggest a love song for Hydra to sing. Afterward, Hydra would receive the full 25 billion. 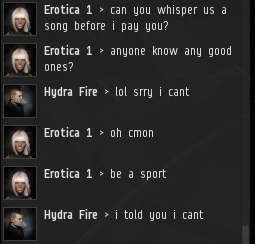 Joe Endicott made a love song request, and Hydra looked up the lyrics online. 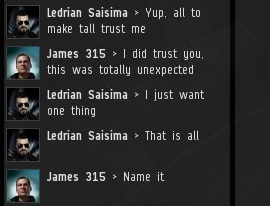 He was now just moments away from winning a quarter of a tenth of a trillion isk. Just as Hydra was wrapping up the love song, something extraordinary was heard. It was the unmistakable, bloodcurdling ring of a telephone. Everyone in the channel froze up like a deer in the headlights. And that is when we began to discover that nothing was as it seemed. 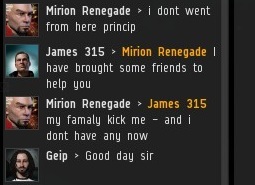 Previously, on MinerBumping... Rebel miner Mirion Renegade petitioned me for bumping him. Despite his emotional appeal to the GMs, nothing happened. 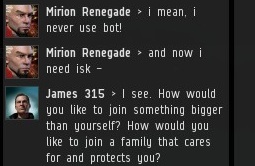 Mirion had no choice but to open a private convo with me--the real authority in highsec. With only his passion and Google Translate to aid him, Mirion began pouring out his sob story to me. Mirion was alone and adrift. He needed help. 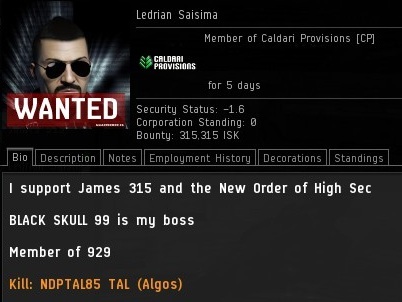 He needed the kind of support system supplied by only one organization in highsec that I knew of. I put out the call to the New Order, and Agents began to join the private convo. 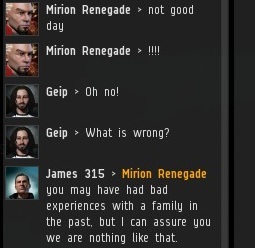 Mirion didn't seem at all bothered by the fact that I invited a bunch of people to crash his private convo. The more sympathetic ears, the better. Once again, he claimed poverty. Mirion is a 2010 character. Could he really be down to nothing but a Retriever? Could he have been so reckless? I emphasized the fact that the New Order only required a paltry 10 million from him. Surely he could afford it. People sometimes ask me why it only costs 10 million to mine in highsec. Given the value of a mining permit, I could charge much more. The market would certainly bear it. But I want the benefits of the New Order to be available to everyone, not just the super-rich. Mirion was candid. He didn't think friendship was possible between us. 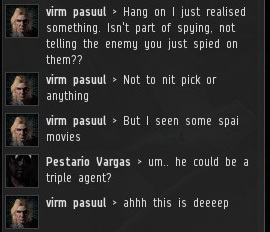 Like a lot of highsec miners, he insisted that he was not really a highsec miner. He had simply lost all of his combat ships. I guess he was as bad at PvP as he was at mining. 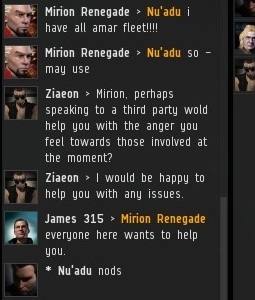 Agent Nu'adu doubted Mirion's PvP credentials. 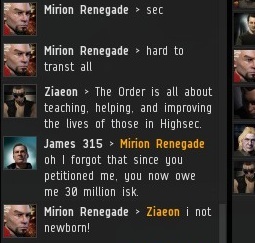 Mirion was appalled that someone would question his military record. I've learned a thing or two from Erotica 1. 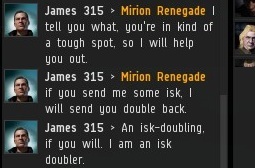 I know how much isk-doubling can help people when they're short on funds. 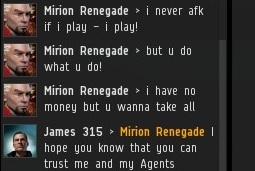 Though I'm not a professional isk doubler myself, I was willing to take from my own wallet and match whatever funds Mirion did send. 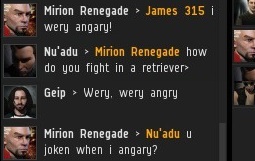 But he ignored me in favor of continuing his argument with Nu'adu. I always err on the side of mercy. 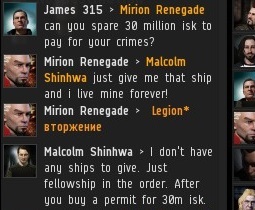 I had forgotten all about Mirion's petition, and the fact that he owed me 30 million isk. 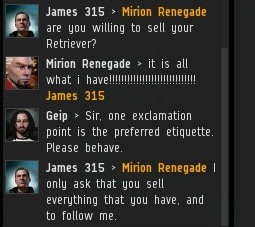 I presented my new demand to Mirion while I waited for him to translate everything that the Agents were saying to him. 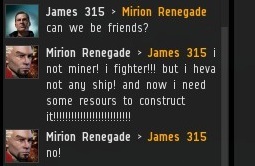 Meanwhile, Mirion insisted that he would leave his mining career behind, if only he could get his hands on a Legion, a tech III combat ship. Apparently he used to fly in Legion fleets, before his old corp lost too many battles and kicked him to the curb. 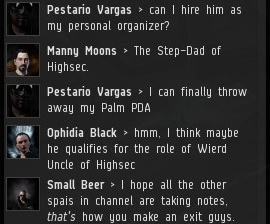 Leave it to the New Order to lift up the broken, and to clean up the messes made by nullsec violence. I offered Mirion a fresh start. If he paid his Red Pen fee, he could cut ties with his sordid history of illegal mining, and he could join the New Order family. But for whatever reason, Mirion felt he was entitled to mine in my territory. If he was to make any progress at all, he would need to swallow his pride. 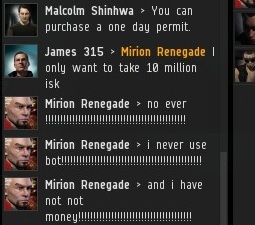 I am a bit of a polarizing figure in the EVE community. People either love me or hate me. I take comfort in the fact that the best people tend to love me, while the worst people tend to hate me. Out of nowhere, I received an EVEmail from Throckmorton. I had never encountered Throckmorton before, so I was intrigued by the passionate emotions he felt toward me. 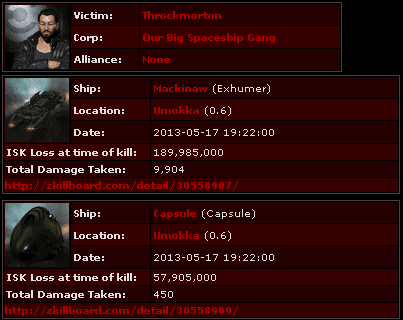 As I suspected, Throckmorton was a highsec miner. Two days earlier, a gang of Knights dealt justice to him. I don't know why it took him two days to send me a one-line EVEmail. I'm also baffled by the fact that he called me "greedy". 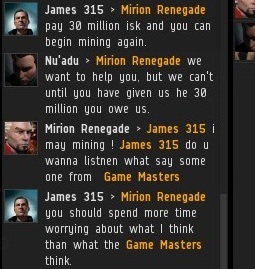 Aren't highsec miners the ones whose "gameplay" in EVE is centered around the acquisition of wealth? 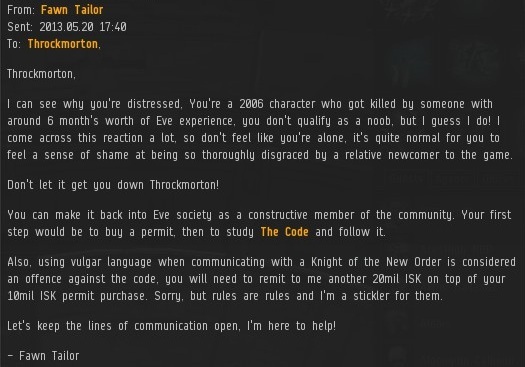 Agent Fawn Tailor, one of the Knights on the killmail, also received an EVEmail from Throckmorton--oddly, an entire day after he sent me an EVEmail. I was a bit surprised that he contacted me before contacting the people who exploded his ship. Fawn Tailor graciously responded to Throckmorton, and pointed out that Throckmorton was a 2006 character. I hadn't noticed that. It was plain-as-day evidence that Throckmorton had no business being a highsec miner. Throckmorton replied. If he wanted to get away with his crimes, he shouldn't have sent it; he incriminated himself further by revealing he was unaware that anyone was ganking miners in highsec. How bot-aspirant is that? Going back to where I started, note once more the contrast between Fawn Tailor and Throckmorton. You can easily see who the good guys and the bad guys are. The Goofuses and Gallants of EVE make themselves known by their conduct. 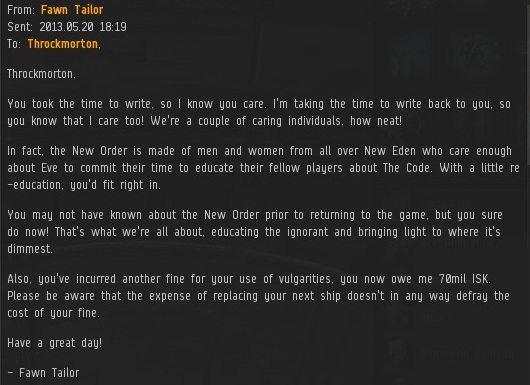 Is it any wonder that the residents of highsec are flocking to the New Order?